Are you sick of the same old routine every weekend, whether it’s Flashback Fridays at the Liquor Store on York Street or meeting your friends at the Whiskey Bar, but not sure how to shake up your routine with your friends? It’s always great to have a place you can go out and be comfortable, but when all the waiters and bartenders know your name, it might be time to think about trying your hand at something new. Don’t worry, you can always come back to your favourite haunts, but it never hurt anyone to throw a wrench into their routine and do something adventurous on the weekend. If you’re thinking it’s time to add some spice to your life, you might want to know that now you and all your Ottawa pals can throw an axe throwing party. 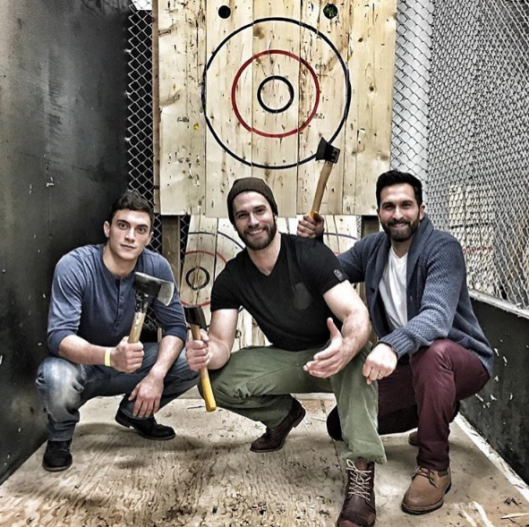 Ottawa has a great night life scene and it’s only been improved by the arrival of axe throwing venues like the Backyard Axe Throwing League (BATL), which cater to both large groups and offer walk-in times if you decide to do it on the spur of the moment. The old sport of axe throwing, once something you might only ever see at lumberjack competitions, has been revived and adapted to a modern, urban audience so that everyone can enjoy it. Here’s how it works: you and your friends book a 2 and a half to 3 hour slot at a league venue; at the beginning, instructors dedicated to your group teach you the proper form to safely throw a hatchet and the secret to landing a bullseye; finally, you play a round robin tournament, where everyone gets to face off against each other, followed by a competitive elimination round. The format gives everyone time to pick up the tricks of the trade and hone their skills for when it counts, and you can make an evening of it. One of the advantages of the Ottawa’s BATL location is its licensed bar and kitchen, especially if you’re looking to go axe throwing to switch up your typical Friday happy hour routine. Kick back, relax, crack open a cold one, and forget all about the stress of the work week when you go for the clutch (that’s axe throwers’ talk for a 7-point clincher you can take on the last throw of your round). If you discover that you haven’t had enough after your one night axe throwing party in Ottawa, rest assured that there are plenty of ways to experience more, from dedicated times for walk-ins to league nights. Leagues have been popping up in cities across Canada and these days you can find a time to play just about any day of the week. Even if you can’t commit to the league experience, dedicated walk-in times allow you to practice at your own leisure and de-stress after work with some physical activity, operating like a public skating rink. Everyone can enjoy axe throwing, so why not shake up your weekend plans and try it out with your friends?